The Cake Lady's Blog | "Let them eat cake." Sharpies are possibly the most amazing things in the world…next to food. Sharpies draw on anything! Glass, tin, wood, people and much to my amusement….food! (I do hope they are not toxic!oh well!) 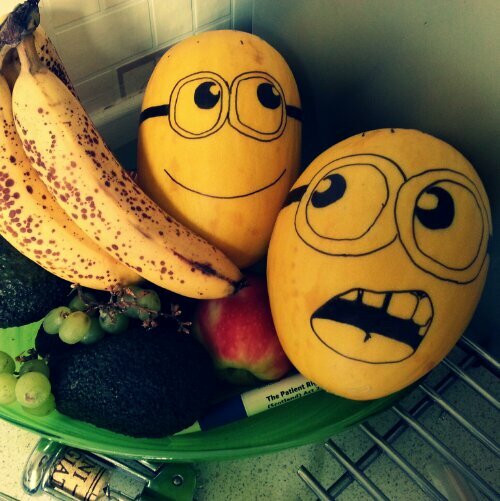 It started with melons….which while shopping, I discovered look just like minions. And reduced melons are even better! So I bought one….going back the next day to provide my new minion melon with a friend. 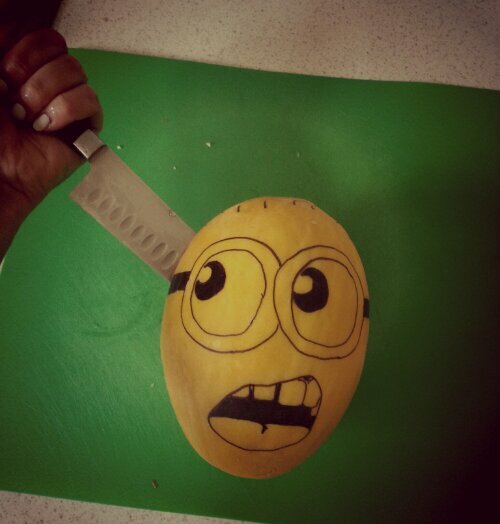 As much fun as this was to do….it proved to be quite a moral dilemma in the long run, because when you want to eat the melon you have to kill the minion. You cant kill a minion, they are just too…minion-y and cute! The killing of the minion was left to me….it was a sad day. Ah well I did want to be a butcher when I grew up! Drawing on the melons was thoroughly amusing and I loved it….so much so that I found myself wandering round the flat with a sharpie in my hand looking for things to draw on. Not great when you rent!!! 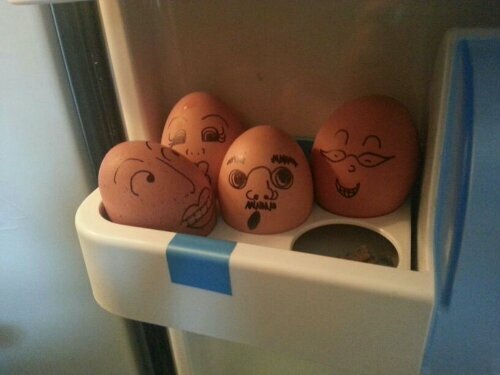 Fortunately my flatmate was spared….because I had to devise a way to differentiate the boiled eggs from the normal eggs….. I do like to be organised! Thursdays are a busy day. Thursdays are a long day. I’m also pretty sure that my Thursdays start before everybody elses and end a lot later. Both my flatmate and myself get home fairly late, neither of us having eaten either. Now I don’t know about you, but I am not a nice hungry person, so whatever it is that I have on a Thursday night, it has to be blooming quick! Enter the savior of my teenage years, Mama noodles. 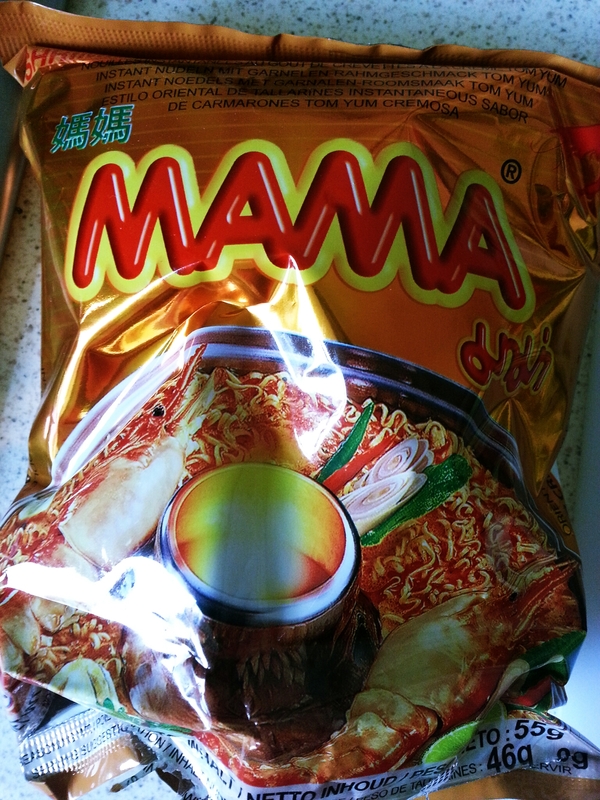 I learnt to love Mama noodles when I lived in Thailand as a teenager. I didn’t have a normal ex-pat life, all my friends were Thai. So I ate the way they ate. And Mama noodles are what they ate. Far from your average packet noodles…Mama are spicy (well the Creamy Tom Yam ones that I have are anyway.) And please don’t be tempted to take them at packet value, you make them your own. 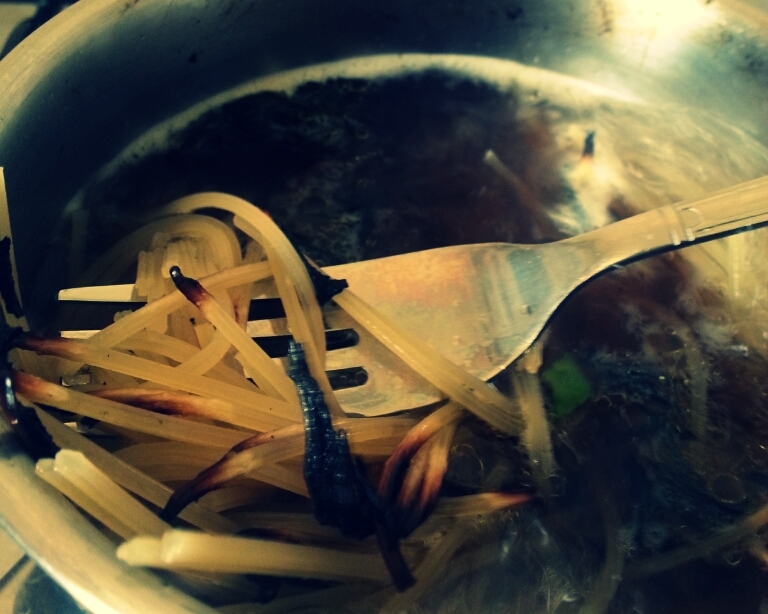 When the veg is cooked a bit (still crunchy, not soggy) you add the noodles. Meanwhile, in a living room nearby, a flat mate is getting the DVD ready on pause so that no time is wasted. 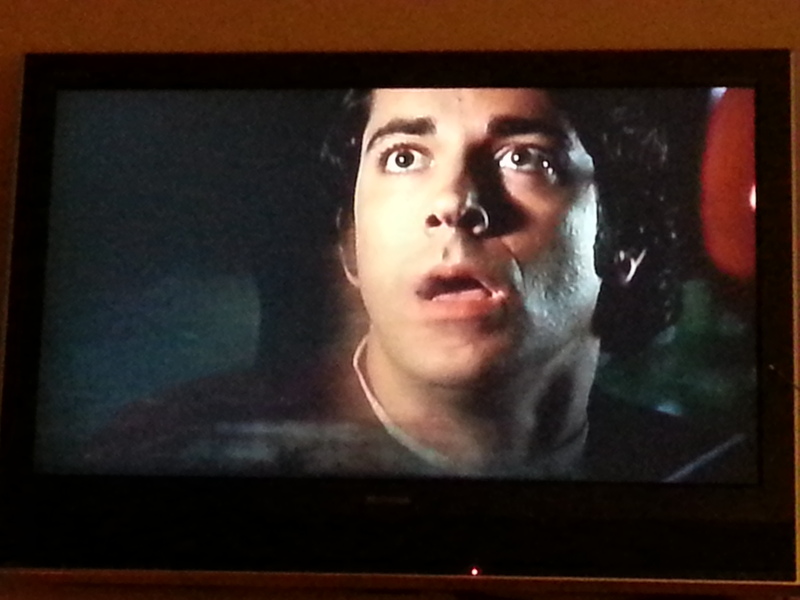 Noodle night is also Chuck night. I would normally start every post with a quote. As this post is mostly a conversation, I feel that it is, in its own right, quite quotable. Flatmate: No, she won ‘Best Un-Supported Actress’. Me: Are you sure? I don’t think that’s a category. Flatmate: No, no, it DEFINITELY said in the paper yesterday that it was ‘Un-Supported Actress’. Me: (Feeling slightly confused. Then the penny dropped.) Erm, do you think they were talking about her lack of bra? I would have loved to have been the girl sat behind us on the bus that day…I cried with laughter for the rest of the journey! I used to watch the Oscars every year. But that was a long time ago. Now I’m just happy to watch something mindless to switch off. But…there has to be some sort of snacking to be done. My current obsession is Guacamole! I figure that if I just take a couple of celery sticks through to the living room with me then I won’t eat the lot…but then I work out that I have fingers and that they are just the right size for scooping guacamole into my mouth! The recipe I use is from a fellow blogger called Illustrated Bites. Whatever your chill out TV snack is, enjoy! Do you get those days? You know, the ones where every cup, glass or plate you pick up has a suicide wish and leaps into the air and onto the floor? And you know what, crockery and glass don’t bounce do they? Those days when you sleep through your radio alarm playing rock music at you for an hour and at least one phone call to find that you are once again LATE? Those days when the words just won’t come out right and you seem to offend anyone and everyone in your path just with a smile? Those days when you forget to take lunch and you’re too skint to get anything? 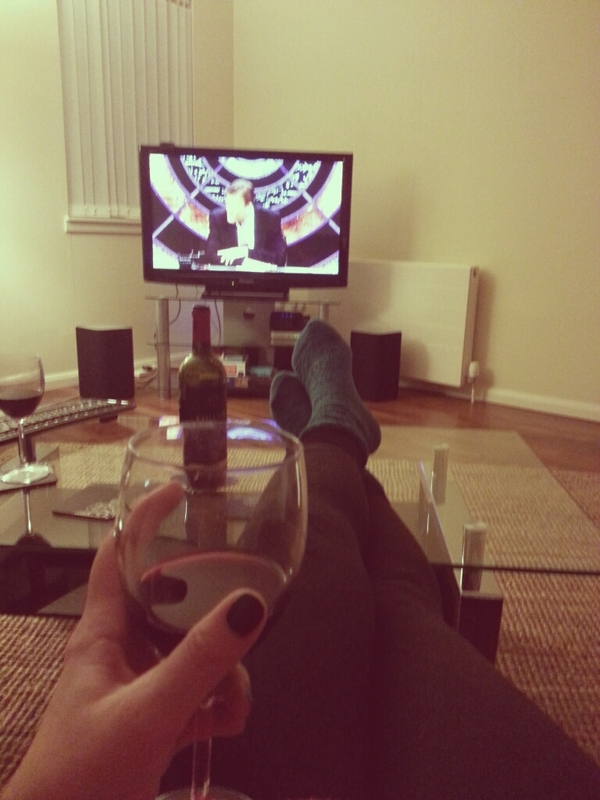 Those days where you accidentally click the wrong button and post Wednesdays blog post on Sunday? Those days when you get home and think “Spaghetti! That’ll be quick.”? I had one of those days too…. P.S. These days are not Wet Lettuce Days, these are just THOSE days! It starts with a sore throat. It goes on to be an even sorer throat. Out comes the hot lemon! Coughing. Coughing so much that you don’t know if your stomach is sore from the work outs that you have been doing in that desperate January effort to get fit or from the constant coughing up of a lung. Blowing your nose ALL THE TIME, is there an end to the snot? The gross bit being (if you are of a sensitive nature, don’t read the next part) gunk coming out of your eyes. Its just not nice. Oh, and one of my favourites (as you are never sure when this one may happen) the unsuspecting ear pop. Ah! You didn’t even realise they were blocked did you? Tadah! You can hear again. Thing is, everything goes wrong when you are ill. You also become someone else. This wet lettuce character that flops about. The type of person who can no longer get out of bed, the one that slides out and then crawls everywhere else from there. The person that walks to the fridge, opens it and stares at all the food that is in there (because there is food in there) and is such a wet lettuce that they can’t find anything to eat. Poorly you lives off cans of soup from the cupboard, the ones that you really aren’t sure how long they have been there. But you don’t care, you want soup. Even if it does taste a bit funky, but that doesn’t matter because, hey, you can’t taste properly anyway! THAT’S when you know, you are really not well. 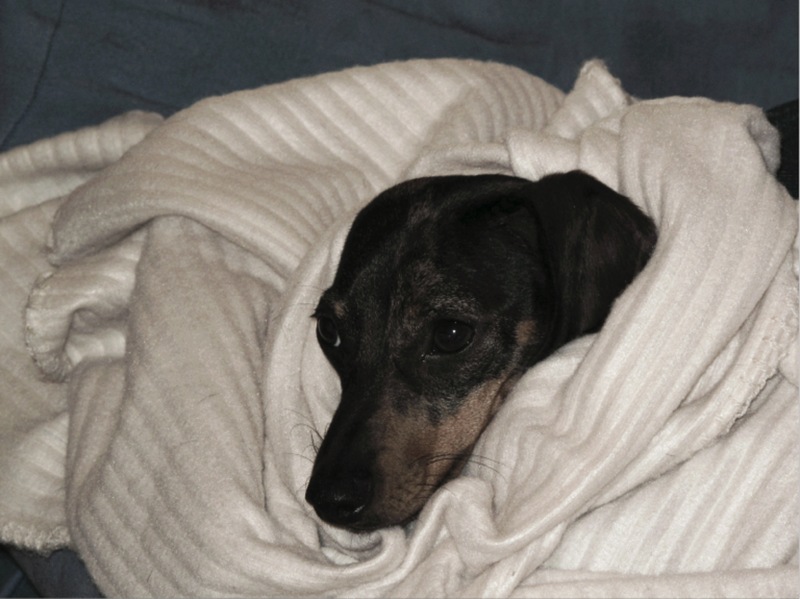 Note: Thank you for Oscar-Hugo for demonstrating his wonderful modelling skills. I love my slow cooker a lot. It was a slow romance (no pun intended) that took years to build up. Over time, I had been match-made with slow cookers. I guess it just wasn’t the right time for a relationship for me, as I didn’t gel with any of them. Even when I lived on my own, and with how much I love cooking, I didn’t bond with the slightly cracked pot handed to me, preferring to go eat at friends’ than to pull the old beast from the back of the cupboard and put it to use. Now I think about it, how sad my slow cooker must have felt: being so close to fulfilling its purpose, yet so far. I always knew it was there. I always knew that it would be what I wanted, but being new at this whole relationship I wasn’t sure how it worked. As the slow cooker had always been there in my life, I realized that it had already made the first move. It was now just waiting for me to respond accordingly. I was scared. What if my response was the wrong one? What if it burnt my food (or caramelised it as my flat mate calls it)? Or worse yet, what if it made my food taste bad? I just couldn’t face that kind of humiliation and rejection! I had no cook book for this next step – I didn’t know where to start. However, after many weeks of deliberation and getting fed up of eating so late, being too tired to cook and eating rubbishy plastic food, I was finally worn down. This relationship was worth a try, it couldn’t get much worse. Stew it was. 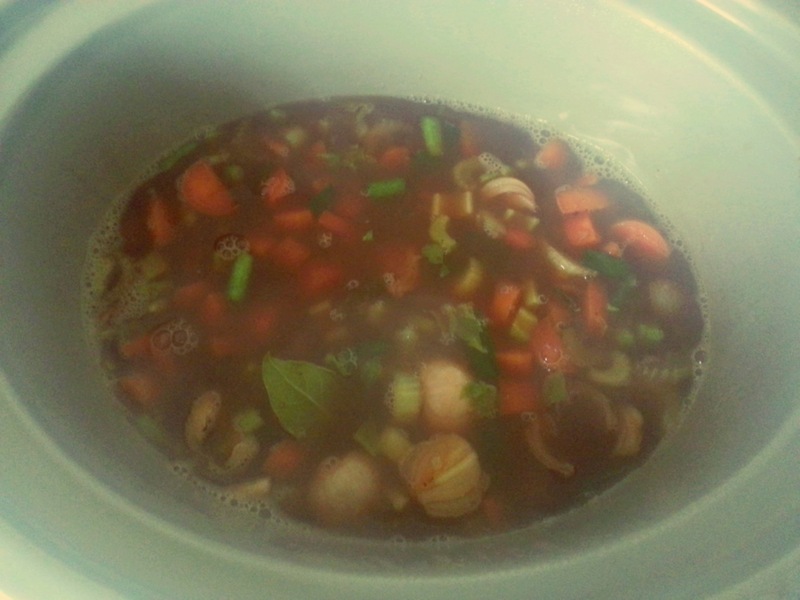 I’m not totally sure why I went with stew as I don’t make it normally, let along slow cookery. I used a recipe that a friend had given me and just tweaked it ever so slightly to the ingredients I had to hand. After all you can’t put things you don’t have into a relationship, it takes a little compromise sometimes! At other times, you may have all the ingredients and that’s good too. So in went the ingredients (beef slightly browned etc.) and on went the switch set at medium at 7am. With which I grabbed all my stuff and went to get the bus. Now being the unfounded worrier that I am, I then spent the next 2-3hrs worrying that the plug would spark, the slow cooker malfunction and the whole flat would blow up in a fantastic explosion of sorts, possibly destroying the whole city of Edinburgh in the process… After all I had just left a stranger in my flat – there was no telling what it might do! That was until, after said 2-3hrs I actually just had to tell myself to stop it and get on with it. The day continued as eventful as it should have been. It’s only when I was sat on the bus returning home in the dark evening that the panic started to seep back in. “What will it have done? Will it have thrown a party and trashed the place? Will it have become so resentful over its years of disuse that it blows up as a final act of defiance? !” As I walked through the door of my non blown up flat, it hit me. 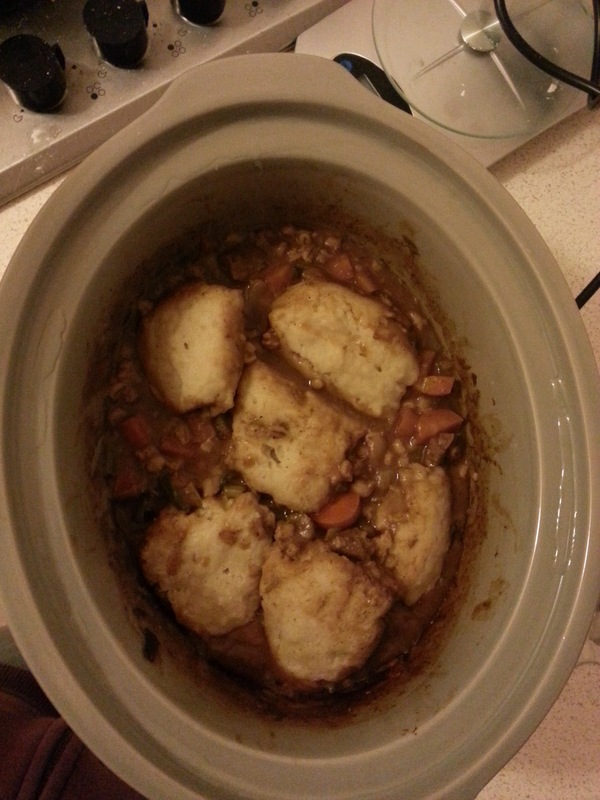 This slow cooker had no malice, it loved me and had cooked me an amazing stew (first ever!!!!) and it welcomed me home to the smell of my dinner. Needless to say, the bond between me and my slow cooker is growing stronger each day. I talk about it all the time! I even have a little relationship guide book now (other wise known as a slow cooker recipe book.) We see each other a couple of times a week, sometimes more. It’s going well, we have recently advanced to curries and have been discussing the idea of cake at some point in the future. But that’s definitely for the future. I’m not ready for that just yet. I’m glad my slow cooker stuck around and was so patient. I’m stubborn and don’t like to be made to do things (even if they are for my own good and the good of those around me.) Thanks to its patience and slow cooking, me and my slow cooker got a good thing going on. 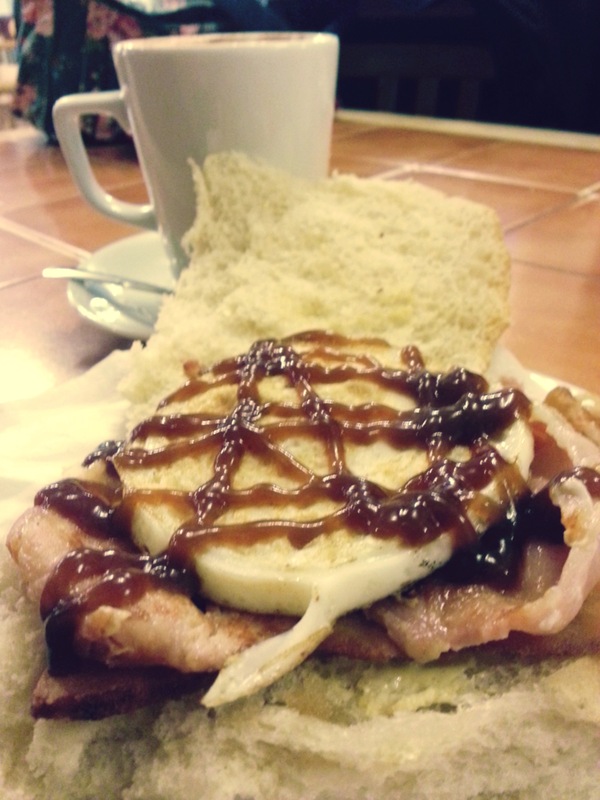 I love the runny egg yoke and brown sauce. The crunch of the tattie scone. The warm energy of the coffee slipping into my being. The mirrors that make Phil admire himself. The red sauce/brown sauce debate with Sharon. The simultaneous drip of yolk from our baps. The cheap and cheerful décor that loves and promotes the city it is in. The posters on the wall. The best music playing anywhere with artists ranging from Ben Folds Five to Blind Melon, from AC/DC to The Beatles. I love the way that this should be just another greasy spoon, but yet when the rain is pouring outside, this is the homeliest place on earth. I love the way that nothing matters when you’re at Snax, and the way that breakfast there just doesn’t feel right without Phil and Sharon.